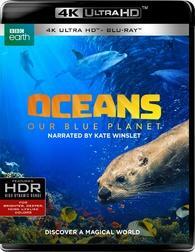 Narrated by Kate Winslet Oceans: Our Blue Planet takes us on a global odyssey to discover the largest and least explored habitat on earth. New ocean technology has allowed us to delve further into the unknown than ever before. From the coastal shallows to deeper, more mysterious worlds, we reveal the spectacular stories of life beneath the waves.